how's yellow go with this blue? Dragging parts of the Saab home to play with. Had some cheapo Cibie-knock-off headlamps and some yellow bulb “balloons” to replace the broken sealed beams with. These are yellow coated, rather than dyed in the mass like the old ones (back when people travelling to France wanted a cheap/quick way to convert their bulbs to selective yellow, this same sort of thing was made to a higher quality) but they look the part anyway. I guess the good part of these is if you get in trouble for yellow headlights, you can just snap them off after the bulbs cool and you have clear lights again. I have also found a pair of Lumax halogen spotlights for the roof rack, and a pair of Lumax British-prefocus fog lights for the bumper, more posting about these later. 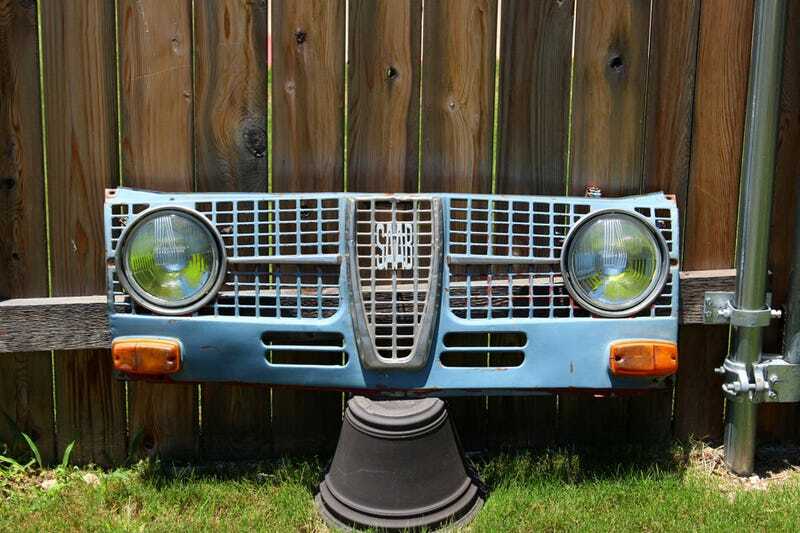 PS: if anybody has a radiator for a ‘68 Saab, please mail it to me.